JML Hardware prides itself on the quality meter box products and services it provides. We supply the trade and public with one of the biggest ranges of Meter boxes and will deliver quicker than ever for both new and repair water meter boxes, gas meter boxes and electric meter boxes. Some of the products in this category that we sell or supply are Universal Overboxes, Architrave Meter Overboxes, Hook on Meter Boxes, Externally fitted Overboxes, Floor Mounted Overboxes, Semi Submersible Lids, Cladded Overboxes and Water Meter Overboxes. 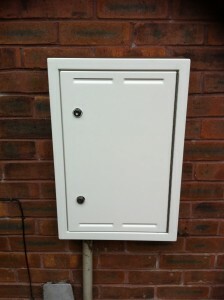 All our Meter Boxes are delivered in perfect order and at the best possible rates. We have some of the cheapest prices in the marketplace, please view our online shop by clicking the categories to the right or by clicking the main Shop Area via the link at the top of the web site. More information on all these products is on their own separate pages, you can access these via the links from the top of the web site or by following the quick links at the bottom of the site. If you need any more information or would like to talk to one of our specialists, please use the contact us page for all the different ways of interacting with us. We as a company really appreciate your service that you provide . It is so refreshing to find some one who will go that little bit further to get the right product for the job. If you ever need a ref just ask me . I would like to thank you for my recent purchases of both gas and electric repair boxes. The initial support and advice was great and the product arrived very efficiently. As you know, one of the boxes was the wrong fitting and this was dealt with immediately. The very next day you had sent someone out and replaced the box with no issues at all, its great when a company puts customers as their highest priority. I can't recommend JML Hardware enough and I definitely wouldn't hesitate to recommend to others. I needed bespoke pipe protectors in custom colours. The team at JML showed great customer focus in providing quotation and manufacture. First class lead time adherence. I Please than the team at JML for the excellent performance. It’s Ben Mills. I ordered 2x (150x155mm) black pipepro soil stack protectors from your company jml hardware over the phone yesterday. I believe it was you that I spoke to…………. Excellent, they arrived this afternoon and are exactly what I ordered. – “And……. ?” I hear you ask. My company deals with complete grounds maintenance, and I’ll be coming to jml hardware before I go anywhere else in future, should I need a product in your range. Great customer service, outstanding quality, and a rapid delivery time………….I’ll not hesitate to recommend you to others. Smashing job Phil, you and the rest at JML should be proud of yourselves, your level of service is becoming increasingly hard to find. Testimonial/Review * Ordered goods one day got them the next day. Well pleased. Big thanks to Julie and Phil. Ace service. Would recommend this company. Spoke to Phil on Tuesday early morning, gave him measurements of my damaged electricity box. He immediately confirmed that I needed an OB8E cover. I ordered it on line and it arrived at midday the next day ( Wednesday ).By mid afternoon I had installed it and it looked a "proper job". Not bad from purchase, delivery and install just over a day.Easy to install and a very good quality product.Excellent, helpful and friendly service. First class service all round. Sent of email requesting the details for correct overboxes for gas and electricity meters on a Sat, got a reply on a Sunday, which in itself shows committement. Ordered the goods and with 48 hrs they were fitted, with extreme ease, they fitted perfectly and customer over the moon. Sales and service are first class. Used these guys several times over the years and every time the service has been brilliant. Just dropping you a line to compliment you on a high level of service and a nice quality product. The electric meter cover fits perfectly and looks smart.My questions were answered quickly and accurately over the phone prior to ordering . Keep up the good work and thank you very much. Great customer focus by the team at JML. Prompt follow up to my request for bespoke pipe covers. An excellent performance by the team at JML. Very pleased with the product (Meter Overbox) which is an excellent solution to an old problem. After hunting high and low for several years we stumbled across JML. Filled in the form and with 5 mins had secured exactly what we needed. Goods were here the next day and fitted the day after. Testimonial/Review * Many thanks to the JML team especially Phil for the excellent service and speedy delivery,will recommend you to family and friends. As you no one of the boxes was the wrong fitting and this was dealt with immediately. The very next day you had sent someone out and replaced the box with no issues at all, its great when a company puts customers at there highest priority. I cant recommend JML Hardware enough and I definitely wouldn't hesitate to recommend to others. Hi Phil, just want to say a big thank you for the gas pipe cover received today it was greatly appreciated and is a perfect fit. Needed a replacement meter box and wasn't sure which one to get and so I emailed JML on the weekend and got a response within hours telling me which one to order! Then when I ordered the wrong one by mistake JML contacted me proactively within hours letting me know that they had changed my order based on the email exchange! Amazing service. I found Phil online, called him and he told me to send a picture of the two meters, then told me what I needed, they were dispatched next day and are now fitted. Thanks again Phil. Received the goods. Absolutely excellent. Spot on cheers.